Moonbeams in Cyberspace: BEST GIFT IN THE MAIL EVER!!! BEST GIFT IN THE MAIL EVER!!! I recieved one of the best gifts ever in the mail! What a total treasure box of goodies! My very good friend Cheri is a baking genius and I am one of the lucky ones who gets to taste the fruits of her labor. I was godsmacked when I recieved this large shoe box FULL to the rim with 13...YES.. 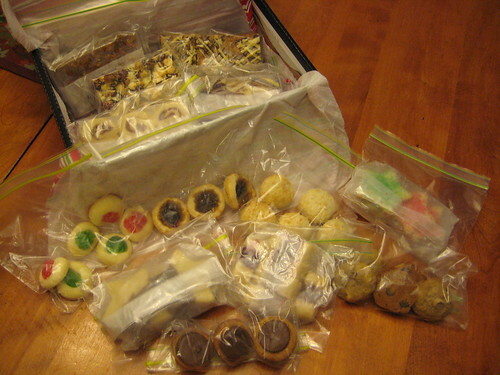 13 different kinds of cookies, squares and confections of all sorts...all individually packed in half dozen bags! OMG! It's enough to make this fat girl tear up! But mostly, it's such a gift of time, and loving care. How touching and valuable is that I ask? Needless to mention the fortune it cost to ship across Canada from Victoria BC . So, thank you again Cheri my dear friend of over 25 yrs..Words are so hard to express , as my mouth is full at the moment!!!! Eat your hearts out hehe....they are all MINE !! !...oh damn, I better share with my family...lol. Posted by Moon at 1:17 a.m.
WOW! That is such a fantastic guft...! Anyone who bakes so very many types of cookies and packs them so very carefully is a TREASURE! Yum Yum Yum! Okay Moon, I know you're nice and everything but what in the world did you ever do to deserve such a friend? I'm out to steal Cheri just need to know where to find her. Oh well, I guess you can't force friendship on someone so you can keep her.....just give me the cookies! Darn! My friend Mara bakes like that. We have an after holiday game night and she brings a big platter full, which is good because I'm not so big on baking...and by the way really relate to your blog statement header. what a gift of love. That would put a smile on my face too. Enjoy! How sweet it is!! She is indeed a treasure. Merry Christmas, Moon! It's okay if you catch me and take the sweet back, Ran made 9, count 'em NINE pounds of fudge. No wonder my hips aren't getting any smaller!